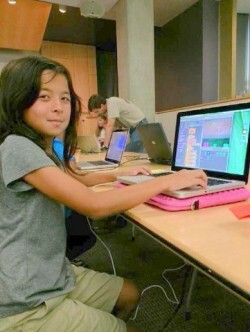 ThoughtSTEM, a company founded to introduce and teach computer programming to students ages 8-18, is connecting with UC San Diego CREATE to offer a weekly workshop to students at Gompers Preparatory Academy (GPA), a UC San Diego partnership school. The brainchild of three UC San Diego PhD students, ThoughtSTEM offers hands-on, project based programs designed to introduce and teach computer science skills to pre-high school and college students. Each week an experienced teacher, along with several UC San Diego computer science undergraduate students, assist the students with their computer programming projects. The undergraduates have an opportunity to not only help the GPA students with their work, but to mentor and share with them what it is actually like to be a computer scientist. GPA students learn to program using a language called Scratch (scratch.mit.edu). This language, along with the curriculum built by ThoughtSTEM, engages students in complex programming concepts such as conditionals, looping, methods and parameters. Esper is looking forward to continuing the partnership with CREATE and Gompers next year. Supporting ThoughtSTEM to bring its STEM opportunity to GPA was part of the CREATE STEM Success Initiative, a new campus effort to leverage UC San Diego’ STEM resources alongside the education community’s to engage more high-need students and their teachers in Science, Technology, Engineering and Math.